Whether it’s your parents or your grandparents, one of the best ways to keep them happy and healthy as they age is to encourage them to exercise and stay active. There are many reasons older members of society tend to want to stay at home and lead a generally inactive life, such as issues with their health. However, it is much more beneficial for them in the long run if they are on the move on a daily basis. 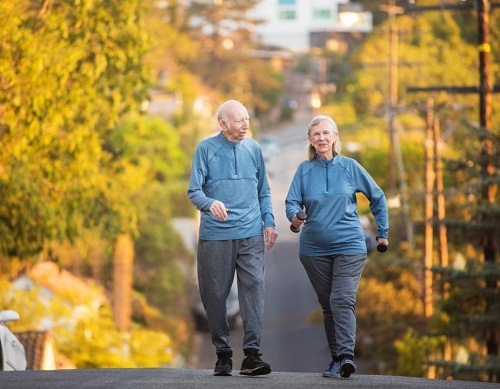 Not only does exercise have many positive effects on physical health, it can also improve the psychological and emotional condition of elderly individuals. With age, weight is much easier to put on due to the metabolism slowing down. Regular exercise can help keep the weight off and even lose some, burning calories and gaining muscle mass in the process. Losing weight helps mobility and reduces the threat of obesity-related disease. Exercise is known to greatly enhance the quality of sleep, as it tires you out and leads to deeper and more satisfying sleep cycles. Good sleep means a healthier body and mind too, as it reenergizes and reinvigorates. Elderly individuals who do nothing but lead a sedentary lifestyle will be much more prone to aches, pains, and illnesses of all kinds. Exercise will not only improve the existing physical issues, but prevent other health problems from occurring. Exercise can be a social activity, something that is crucial for aging or elderly individuals to indulge in. Social isolation is a serious problem for the elderly, and leads to even more psychological and physical health problems. Joining an exercise class or a walking group will give them more chances to interact with others, make new friends, and expand their social circle. Having a good social support system is highly beneficial for their emotional health in the long run. With age, people become prone to depression, mood swings, and a general pessimistic attitude towards life. The happy hormones released due to exercise can greatly improve the mood of seniors, and alleviate their stress levels significantly. At iCarePros, a completely reliable home care agency, we assist you in getting your aged loved ones moving and on the path to staying healthy and active. Our senior home care services extend to helping them stay well-groomed, aiding in their necessary household chores, keeping them active, and assisting them with any medication or treatments they require. Invest in our services, and you’ll be investing in a better quality of life for your elderly relations!